"One language sets you in a corridor for life, two open every door along the way"
The trailer of this movie quickly caught our attention when it made the rounds. It kept our curiosity quotients high with giant larvae like looking pods hovering a few meters above Earth in many locations. It was not just the trailer, even the poster kept few tongues wagging for quite few teeny weeny controversial reasons - if you could remember !! 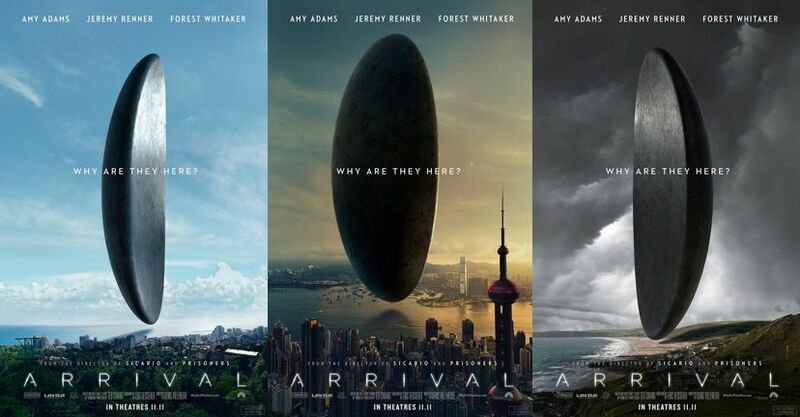 Strange things begin to happen as the pods start hovering over Earth at 12 different cities. What does a language professor have to do with ETs you may think, but she happens to fit the bill perfectly. How Amy and Jeremy try to decode what the ETs (Heptapods here) are trying to convey forms the crux of the movie. Would they destroy us or have they come to warn us? You be the better judge. This movie is taken extremely well and keeps you wondering as to how the sequences pan out. There are parallels - the current version and Amy's vision that go hand in hand. You need watch out carefully to follow the minute details. Overall a well crafted movie, an excellent team of actors and keeps you guessing on whether they will keep you safe with their language or destroy mankind. Spoiler Alert - Heptapods' non-linear language transcends the odds of time. You would need a lot of time and of course discussions with your pals to digest this I know. Kidding :P . Just a little head scratching and then the pieces would fall in place. You will be fine. After all you survived Interstellar after multiple Wiki reads. Do check out this movie. Worth it . P. S - Please do not ask whether we are "qualified" to rate or judge a movie. It is our take on it. Take it or leave it. Happie reading and happie movie watching. A movie I definitely would love to catch up on once it hits our shore.